An employment summary based on the U.S. Bureau of Labor Statistics’ (BLS) January 2016 monthly jobs report. Job seekers have plenty of reasons to be optimistic to start 2016. According to the BLS jobs report, the U.S. economy added 292,000 jobs in December, which was way higher than the 210,000 jobs that Wall Street had predicted for the month. The unemployment rate held steady at 5 percent, according to the BLS’s Jan. 8 report. The government also revised upward October’s and November’s employment gains — 50,000 higher than previously reported. 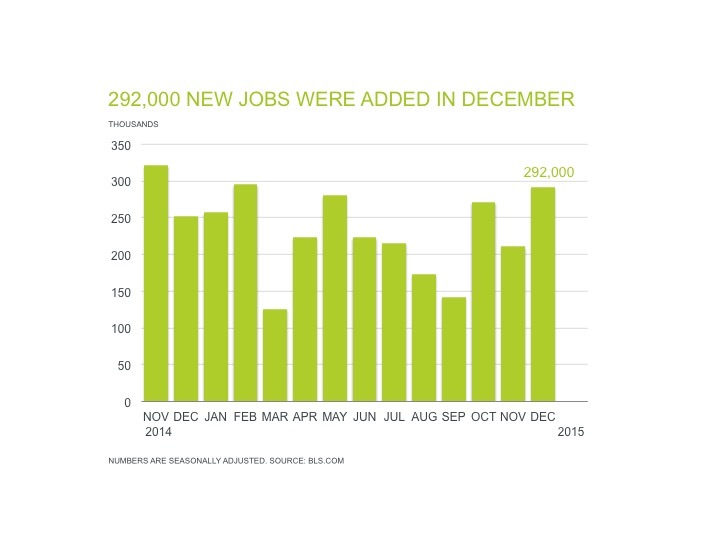 Overall, 2015 was a strong year in terms of employment gains. The economy added 2.65 million new jobs—its best performance since 1999. The healthcare industry continues to be one of the strongest sectors of the economy, adding 39,000 jobs in December. In 2015, healthcare created 40,000 jobs a month, nearly double what the sector added the year before. Ambulatory services (+23,400 new jobs in December) and hospitals (+12,300) are offering current job seekers relatively more opportunities than other areas of healthcare. Nursing care facilities (+2,500) and child day care services (+200) offered the least number of new jobs for the month. Since October, job gains in the U.S. have averaged 284,000 per month. However, average hourly wages remained unchanged at $25.34 an hour. Stagnant wages have been a persistent problem for American workers since the recession, and it remains a challenge in the current economy. There are millions of part-time and temporary workers and that allows employers to keep wages low. Some economists believe that lack of wage growth will continue to plague the American workforce for years to come, as high-paying manufacturing jobs face the prospect of being relocated overseas. The manufacturing sector performed weak toward the end of 2015. While the economy created a robust number of jobs in 2015, thousands of people were also ushered into unemployment lines. (There are about 2.2 million people who are receiving jobless benefits.) In December, jobless claims increased to its highest level since July 2015, increasing by 20,000 to 287,000 in the week ended Dec. 26, according to the Labor Department. Economists had forecasted 270,000. The official unemployment rate is pegged at a seven year low. But now the conversation moves to whether the Federal Reserve will enact further rate hikes in 2016—many on Wall Street predict that they will. In December, the Fed increased the target range for the federal funds rate from 0.25 percent to 0.5 percent, up from zero to 0.25 percent. It was the first rate hike since 2006. For other workforce insights, visit ajilon.com.